WWE NXT call-up Lacey Evans finally has been assigned to a brand for good. Lacey Evans will be making her home on the red brand of WWE RAW. Not only that, she had her first match on WWE RAW since having confirmed her position on the red brand. 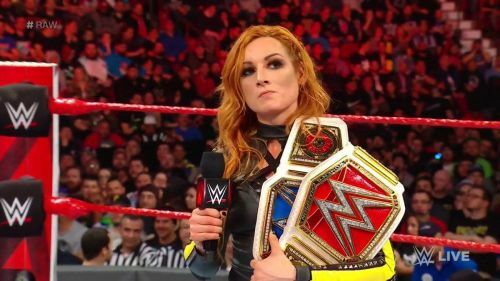 It was not an ordinary match either, as the winner of the match would become the new #1 contender for Becky Lynch's RAW Women's Championship. Lacey Evans has transitioned from ramp walks to attacking the WWE Women's Champion Becky Lynch lately. She assaulted Lynch suddenly after a ramp walk on RAW last week and then did the same on SmackDown Live the next night. Evans has been one of the top contenders on NXT and made her main roster debut in the WWE Women's Royal Rumble this year. She was able to put on a good show and went on to put on a similarly impressive show on RAW this week. Lacey Evans challenged Natalya to a match for the #1 Contender's spot for Becky Lynch's RAW Women's Championship in her WWE RAW debut after being confirmed officially. The match was interesting but by the end, only Evans was left standing after an impressive Jumping Top Rope Moonsault to Natalya put her opponent away. She looked like she was in trouble for a while, but it turned out that she had things handled. Lacey Evans is about to have the biggest match of her life soon, as she will be able to compete against Becky Lynch for the RAW Women's Championship in the coming episodes. Given that commentary mentioned that Evans will be challenging only for the RAW Women's Championship, this may mean that the WWE Women's Championships are not united.